BBB014 – Transcript – What Bugs People about Evolution? OK, back to the interesting stuff. The topic for today is why people don’t like evolution and what is it that people get exercised about? Many people object to being labeled as animals, but you can’t really argue about that, because we are. An animal is an organism. That means it is alive (check), an organism that is multicellular (check), eats its food (check) and is able to move about more or less freely under its own steam (check and check, where do we disagree on this?). I mean if you are trying to argue with a scientist, that’s the definition. If you want to make up your own game, then that’s a different story. The next thing that bugs people is random variability, and that is part of the usual explanation of the theory of evolution. The idea of randomness creating this Garden of Eden bothers almost everyone, when we look around at all these wonderful, elegantly adapted organisms. But if you have heard that argument, I don’t think it was from a biologist. The fact is that the process of evolution is the information highway of the whole ecosystem, and the information is no more random than information that runs the internet. The internet runs on — oops, I think I might be over my head here, but does the internet run on electrons maybe? Is the dance of an electron a random event? Perhaps. But once they get organized into a recognizable and transmissible and maleable pattern — then they are not random any more and can be used to transmit information. Maleable means it can be changed in response to outside forces, which in the case of the internet is us. That doesn’t seem to upset people. Well, so there is an element of random variability in evolution that relates to the way the genes are sorted every time sexual reproduction occurs. So far as I know that’s the only part of evolution that is random, and the variability that it generates has a very important role to play in the overall process. Otherwise, the genes are solid facts that normally don’t change, and they do get sorted in a pattern that is recognizable and transmissible and malleable. In the case of evolution, the pattern of gene transmission of every normal species is responsive to natural selection, which is non-random. So – what is the next pet peeve? Dinosaurs? Or anyway fossils. So. What to say? Dinosaurs definitely existed and they had genes and genomes and presumably they had gene pools. One of them, for example, had the same sort of gene that causes red hair in humans. I don’t care very much about prehistory, because I like to know how things work today, so it would be really difficult to get me into an argument about fossils, because I was not there. I will never know exactly, and if I have an opinion it will not change one little atom of the reality of whatever happened 10,000 or 10 million years ago. Supposing we get into this huge long debate and someone wins and someone loses, it still won’t change the reality of whatever happened and we will never know what it was. Meanwhile, we now today are on the verge of destroying the ecosystem, and I think preventing that destruction is quite a lot more important than arguing about something we will never know the answer to. Whatever God created is OK by me. It’s what we are doing to destroy it that I think is the next thing to criminal. There is absolutely no doubt that evolution is at work in every instant of every moment of our survival and it will be so long as the ecosystem survives, because the process of evolution reflects the genetic information of life, and without this genetic information, the ecosystem would drop dead and earth would be a phenocopy of Mars. Just exactly as you would drop dead if all your genes froze up and stopped working. You would last 3 minutes max. 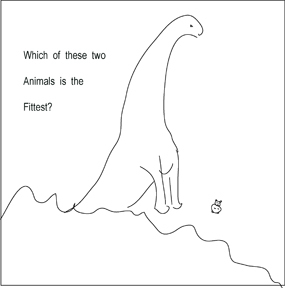 If evolution is survival of the fittest,then which of these animals is more fit? In case you can’t tell, the little one is the mammal; the big one a dinosaur.